Orange County is moving up in the world: it now has its own craigslist. Every so often, I get an E-mail from someone who's read my blog and wants to know my thoughts on whether he/she should become an expat and go live in Hamburg. Usually the emailer doesn't have a job set up and waiting for them in Hamburg, or even any contacts in the city; most of them seem pretty fuzzy as to what they'll do to support themselves. Sometimes the emailer doesn't speak any German. I get these E-mails often enough that I've evolved a more-or-less standard response; my reply to the latest emailer is reproduced below. For those of you reading who are/were expats (or are Germans/Hamburgers), how often do you get this kind of email? Do you respond? Do you agree with my advice -- or are there things you would add or change? I realize that I'm pretty risk-averse (even though I've gone to live in Hamburg twice), so I don't want to rain on anybody's parade and crush their dreams of living abroad with my too-cautious thoughts. On the other hand, I don't want to encourage someone to put a spare change of clothes in a bag on a stick, skip over to Germany thinking "I'll teach English/work in construction/pick fruit/play my accordion in the subway!" -- and then have them cursing my name as they're deported for overstaying their visa or thrown in jail for Schwarzarbeit. It's an absolutely beautiful city. Hamburgers are inordinately proud of where they live, and they have every reason to be. The cultural opportunities are awesome -- lots of museums, parks, and the like; good nightlife and restaurants; there's always *some* kind of festival or special event going on. We miss the "let's just leave the house; we'll find something" atmosphere we had in Hamburg. People and Language: People are friendly; the whole 'northern Germans are dour, gray, and unfriendly' stereotype is a total myth. Going about day-to-day tasks (light shopping, etc.) with minimal/nonexistent German should be no problem at all. *Many* people speak fragmentary-to-excellent English; however, the 'all Germans speak English' stereotype is *also* a complete myth. Once you hit the ground, you'll want to start learning as much German as you can, as quickly as you can; while nobody's expecting you to be fluent, the person-on-the-street will often warm up to you a lot more if they can see you're at least making an effort. The average Hamburger is probably not too fond of the USA these days, but nobody we met ever had a problem with us as individual Americans. Jobs: frankly, I think it'll be awfully hard to hit the Hamburg job market without speaking German and without any connections. The German economy is still doing pretty badly and competition is high; most companies will presumably want to hire a native and avoid the extra expense and legal hurdles involved in hiring a non-EU national. (And not speaking any German seems an obvious and particular handicap.) As an American, the most straightforward path to German employment is probably to find an American company with offices in Hamburg, hire on with them, and work your way to Germany from the States. Alternatively, if you're flying blind, you'll want to expand your social net as widely as possible soon after you arrive in Hamburg; I know a number of expats who were able to parlay an under-the-table, friend-of-a-friend first job into more gainful employment. (I have no idea what happens if you're caught working a black-market job, though.) Note that without a job or extenuating circumstances (like, say, being part of an educational program or marrying a German), the maximum length of time you'll be able to stay in Germany is ninety days. Other Resources: If you haven't found any of these already, there are a couple of books you might want to look at: The German Way, by Hyde Flippo (and I see he now has another book, When in Germany, Do As The Germans Do) and Culture Shock! Germany, by Richard Lord. These books were helpful in answering some of our basic this-is-too-embarassing-to-ask-somebody questions. Additionally, there's a "German Way" Yahoo group and a Web site to go along with Flippo's book. In short, if you can come up with a workable plan, *GO*! We loved Hamburg, and I'll always remember it very fondly. But I think you've got to be realistic about economic/work/visa issues, too. I've had a number of people contact me with vaguely formed plans about moving to Hamburg -- "I'll just get a job teaching English!" -- and I think those total-seat-of-the-pants days are long gone. Can you believe that Shelby and I got married three years ago today? Hooray for us! Shelby is already telling you about our new furniture from IKEA. I think that we (or at least I) imagined that when we bought this new house, we'd be grownups -- no more furniture that comes flat in boxes! -- and we took some encouraging steps towards no-new-IKEA abstinence when we bought our bedroom furniture, but this week we broke the pledge in a big way. We bought three bookshelves and a TV cabinet for the living room, and a sideboard for the kitchen -- at least we can console ourselves that they all came from one of their furniture lines that still consists of real wood with a natural finish, rather than melamine-on-particleboard. That doesn't make it any less of a pain to put together, though. I think that this sideboard may well be the most complex IKEA piece we've ever purchased. And while sitting on the kitchen floor struggling with an endless series of tiny screws as I attach drawer rails, this old piece from McSweeney's (dug out of the Internet Archive) came to mind. Maybe I spoke too soon about that whole Rose Bowl thing . . .
Cal beats Stanford, 41-6! Roll on you Bears! And did I mention that Cal football is ranked #4 in the nation??!? Hopefully Coach Tedford will stay around for a couple more. Even my most casual readers must have noticed by now that for a blog titled "An American In Hamburg", I wasn't talking about Hamburg very much -- reason being, of course, that we moved back to the States several months ago and I now have entirely new sources of daily tedium to fill up my blog with. 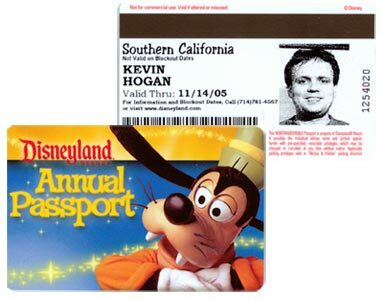 And now I'm an adult, living in Orange County with my own house just a few miles from where I grew up -- living just a few miles from Disneyland! Just a short drive to the beach! Living where it's always sunny and 72! -- shouldn't I expect my everyday life to be just as fantastically wonderful? An old orange crate label -- memory of a day gone by. Now Orange County's main crop is housing tracts, and any open groves or fields are either small, threatened, and vanishing, or kept around for historical sentimentality. The beach; this one is Newport Beach, I think. An entrance to South Coast Plaza. It's not the biggest mall in America -- although it is awfully big -- but it is the highest-grossing mall per square foot! This is where giant packs of Japanese tourists and the local rich come to dispose of their disposable income, if they're not already doing it at Fashion Island. The freeway; this particular picture is on Interstate 5, approaching the "Orange Crush" interchange where I-5 meets state highways 22 & 57. Thank you to all of those who have been reading my blog so far -- I hope that you stick around as I continue under my new identity! So do any of you out there remember which box we happened to put the parts to that one IKEA bookshelf into? You know, the bookshelf with the six boxes and the three posts, where you bolt the boxes to the posts and then bolt the posts to the wall? The bookshelf that's now discontinued and is pretty much useless without the hardware? No? Well, it was worth a try, at least. Well, we're in the new house. It's been a pretty busy past few days. On Friday we drove up with Shelby's dad to San Jose and picked up a 25-foot moving truck from Penske Truck Rental. Bright and early on Saturday morning, we drove over to the storage space and started loading up the truck -- I thought that this was something that would only take a few hours (ha!) and that we'd be on the road around noon (ha! ), but I was wrong -- for us to have any hope of fitting our stuff in, the whole process called for mathematical precision and much deliberation. We finally started back towards SoCal around 6 PM, and pulled into Torrance around 1:30 on Sunday morning. Things really swung into high gear on Sunday, starting at eight in the morning, when I had to call AAA for someone to come unlock the rental truck -- in my bleary state upon that morning's arrival, I'd locked the keys in the truck. After a titanic struggle (and a $45 charge for unlocking a "commercial vehicle"), the AAA guy finally got the truck open and I made it to Anaheim, getting there an hour after I'd told everyone helping us to show up. In the alley behind the house, I finally did what I'd managed not to do, after four hundred miles of driving oh-so-carefully all the way across California -- coming around a corner, I scraped against a brick wall and left a nice, noticeable scratch/dent in the metal rub bars lining the sides of the truck. Monday wasn't much different. The day began with a nice "welcome to the neighborhood" present from the City of Anaheim -- it turns out that Monday morning is streetsweeping time, and for leaving both our car and the moving truck out on the street, I collected $59 in parking tickets! (Yes, the "no parking" signs were there; I was just oblivious.) Next came the gas woman, to turn our gas back on; the exterminators that fumigated our house had the gas turned off to put their tent on, but neglected to tell the gas company that it was safe to come back and turn service back on. Then there was the Sears repairman, to replace our brand-new refrigerator's icemaker supply hose, which had sprung a leak around 11:30 PM the night before. (He didn't have the right hose -- we'll have to wait a week -- but juryrigged a repair that seems to be lasting for now.) After that, a deliveryman came and brought our brand-new wine cooler, which is still sitting all wrapped up on a shipping pallet in the garage. I spent the rest of the day unpacking boxes and waiting for a FedEx guy to bring my new office chair -- he'd tried to deliver twice before on Friday and Saturday, and left a tag saying that he'd come on Monday "between ____ AM and ____ PM". Of course, he never showed up. Two bright spots in the day occurred later in the afternoon, when we took the truck back to Penske -- not only did they overlook the mark I'd left in the side of the truck, they also didn't seem to mind that I'd only left it 7/8ths full (I tried to get in that last little bit, honest -- but achieving a full tank seems to require some kind of special secret trucker voodoo that I don't have). And now we're at the Anaheim Public Library, using their (free!) WiFi hotspot, because not only has our DSL at the house not been turned on yet, they can't even give us an activation date for when it will be turned on. Grrr. I guess that it's all part of our induction into the exciting new world of home ownership. Box unpacking continues at a decent clip; it's not the unpacking itself that's the problem, but the preparation of the space for the soon-to-be-unpacked items that's slowing us down. This is particularly true for the kitchen -- the previous owners covered every shelf and drawer with this awful shelf paper that's achieved a molecular bond with all surfaces, and then covered that with a layer of grease and unidentifiable stains. At least they patched and painted any holes that they left in the walls, though! Feeling pretty darn depressed about the election. Not just because Kerry lost, but because 'morals' and 'values' turned out to be the pivot point of the whole thing -- not the conduct of the war on terrorism or the war in Iraq, not the economy, the deficit, or taxes, not the environment, not civil liberties, or any number of other urgent, pressing issues affecting the nation; in the end, it was gaybashing and abortion that brought out the evangelicals and brought the election home for Bush. I don't share morals with these people (although I am a Christian) -- but we just gave them the car keys to the country for another four years. I don't think that the country is ruined; I still believe that the American people are good at heart; I don't think that this is our Germany-in-the-1930s moment -- or any other ridiculous analogies that people on the paranoid far left like to make. But I'm not feeling very good, either. I guess that I just need time to process -- back to your regularly-scheduled light banter soon. And fortunately we have a new house to distract me -- did I mention that our new bedroom furniture came today? And that last night we bought a refrigerator and a new range? The range has two ovens -- a normally-sized one in the usual position, and a smaller one where the broiler/warming drawer/useless extra "pot drawer" usually goes. So soon we'll be able to cook a Thanksgiving turkey and bake cookies/a pizza/something long and flat AT THE SAME TIME! You can tell how little the broadcasters care for these particular clients, because often they'll play the same commercials over and over again -- one ad two or three times in a row, a different ad, and then back to the first ad for a couple more times. Obviously they're contracted to play a particular commercial n number of times, and they don't care exactly how they get there. Some mild deja-vu, then, as last night we were watching TV and a political ad featuring Governor Schwarzenegger came on. And then it came on again. And then after a couple of different commercials, they came back to play the same Schwarzenegger ad one more time. And Schwarzenegger happened to be speaking out -- in his still strongly Germanic-accented voice -- against Proposition 66. Coincidence? Item #1: Billboard Magazine now has a top-20 chart for ringtones. Which isn't as ludicrous as it sounds, because selling ringtones has become a $3.5 billion business worldwide. $3.5 billion!? What other business that large is based totally and completely on selling products to annoy the people around you? Item #2: While browsing various stores' appliance selections, I came across the SkyBox "personal beverage vendor" by Maytag. For just $568 ("vending machine" plus stand), you can outfit your rumpus room with something that vaguely resembles a vending machine. Optional extra-cost front and side panels let you personalize it with the logos of your favorite college or pro sports team! In alternative options, the household refrigerator, last time I checked, will hold as many drinks as you want -- even five, six, seven different kinds all at one time! -- for no additional premium. Alternatively, you can put one of those dorm-room fridges right next to your TV for $100 -- and if you want to get fancy, you can tape your favorite sports team's logo on the side. 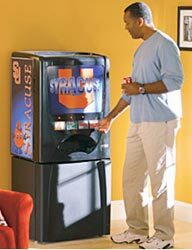 Having done my share of vending-machine stocking in college (our student group had a soda machine as a fundraiser), I predict that a lot of SkyBoxes will be finding their way out to the garage, unplugged, after the third or fourth time they've been refilled by their eager-beaver sports-fan owners.